I’ve said it before. I’ll say it again: Barbecue (more specifically grilling) is the ultimate health food. Grilling adds flavor through smoke and searing, while simultaneously melting out fat. Historically speaking, the discovery of cooking food with fire was mankind’s single greatest discovery and it gave us a competitive evolutionary edge that sustains us to this day. It gives me great pleasure to introduce today’s blog, written by my step-daughter, Betsy Klein. Betsy is the dietitian for the Miami Heat, and she helps our own family mind our nutritional Ps and Qs. And if you like her tips here, check out her blog on the controversial issue of whether grilling causes cancer (heaven forbid). Grilling is one of the healthiest ways to cook, but the traditional burgers, brats, and fatty sides (not to mention booze) are notorious for breaking the caloric bank. Smokin Starters: Take a break from traditional “itos” (a client once coined Doritos, Cheetos, Fritos, etc…) and try grilling eggplant for a dip with grilled multigrain bread, grilled tomato and basil bruschetta, chicken yaki-tori, or grilled vegetable pizza on whole wheat crust. Don’t panic, healthy pizza is not complicated—you can purchase the whole wheat dough at Whole Foods now and simply roll it out. Done and done! 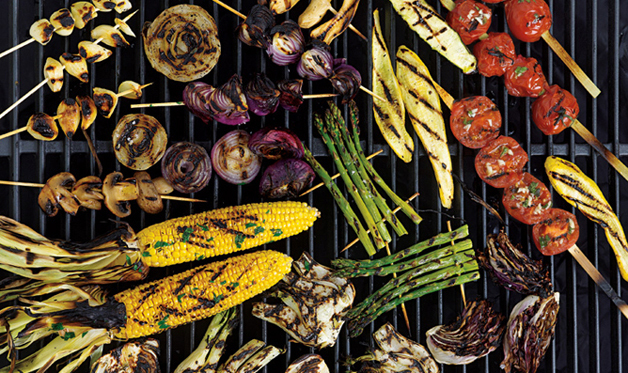 Skinny Sides: A plate of grilled summer veggies rock! Cube them (helps them cook quicker) and brush with a good olive oil for veggie skewers. Intertwine with fruit for the sweet and savory effect—everything tastes better on a stick. Grilled potato salad with sautéed onions or grilled zucchini with olive oil, lemon, sea salt and grated parmesan cheese are old reliables at our house. I have personally turned committed carnivores into veggie lovers with these two dishes. Soak it or rub it: Marinades and rubs add flavor and limit the need for high sugar or creamy sauces—everyone wins! A marinade doesn’t have to be elaborate, it can be as simple as olive oil, lemon juice, balsamic vinegar, salt, pepper, and rosemary (my personal favorite herb). Invent your own signature rub by using your favorite herbs and spices. Pick a proper protein: Swap out processed mystery meats (like hot dogs) for grass fed beef and fish or shellfish. Wild salmon is great on the grill and also has amazing heart health benefits. Wild shrimp with cubed pineapple on a stick is also pretty killer. Skinless organic chicken or pork loin are also good choices. I marinate chicken cubes in sesame oil, soy sauce, rice wine vinegar, ginger, and garlic and grill on skewers; it’s a household favorite. Add grilled onions and grilled sweet peppers to turkey burgers, top with avocado—yum! A little pre-planing, a little thinking outside the box and you just may be able to have fun, eat well, drink some, and still avoid that Monday morning misery.